Selling half a billion records is an accomplishment only The Beatles and Elvis can lay claim to—but selling a quarter billion is still one heck of a feat. Today’s featured artist has hit that mark and is the third best-selling female artist of all time. Getting beat in total sales at acts like Pink Floyd, Led Zeppelin and Madonna is nothing to hang your head about. Mariah Carey was born in Huntington, New York in either 1969 or 1970—for some reason there isn’t consensus on her birthdate. Her grandfather was of Afro-Venezuelan ancestry and immigrated to New York adopting the last name of Carey. Mom was an occasional opera singer and vocal coach before settling down and having children. After being disowned by Carey’s grandparents because of their mixed-race marriage, and also struggles in the community for the same reason, Carey’s parents divorced when Mariah was three. Mariah and her brother moved in with mom, the other three kids moved in with dad. This caused Mariah to grow apart from her father, ultimately becoming estranged. At age four, Carey was struggling to deal with the heartache of the divorce and escaped her troubles by singing along with a radio she would sneak under the covers at night. Carey would hone her craft for years, with the assistance of her mom, finding her groove and style. She began writing songs as well, ultimately finding her break after meeting pop singer Brenda Starr. Starr took Carey to a record exec gala in 1988, a demo was dropped to Columbia Records, and the rest is history. 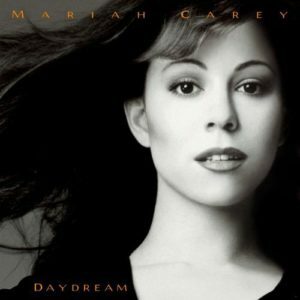 Today I’m listening to her fifth studio album “Daydream” which was released in October of 1995. Her first four records combined sold just 60 million copies, so there was no reason to expect this one to not regress to the mean. Mission not accomplished. To date, “Daydream” has tallied over 25 million sales worldwide. This was quite a departure for Carey – moving more toward the R&B genre over pop. Bringing in hip-hop influencers like Jermaine Dupri and icons Boyz II Men proved to be a worthy venture for Carey, and began shaping her new ‘90s sound. Although being shockingly shut out of any wins, the record was nominated for six Grammy Awards. The change in direction caused a major rift between Carey and her label. Columbia wanted Carey to stick to the ballads, the same music that put her on the map. She was also married to the head of Sony Music (parent to Columbia) at the time, and he vehemently disagreed with the new path as well, causing their relationship to deteriorate. Getting out of my true music wheelhouse on this one, obviously I’ve heard a significant portion of the record—it was unavoidable in the mid-90’s. In some ways, it felt like I was going back to an old classic in spite of never really listening to it on my own. It’s undeniable the talent Carey has as a pure vocalist – I’d argue maybe the third most talented of all time behind Whitney Houston and Florence Welch. Imagine my surprise when a cover of Journey’s “Open Arms” showed up on track #4, what a nice cover for an old rock hound like me. Carey’s marriage fell apart in 1997 and the divorce was final in 2000. Since then it sounds like she’s kind of gone off the deep end a bit, but that’s fodder for another blog. In the meantime, $5 dollars for an iconic singer is pocket change, Happy Tuesday!